New History Hoydens post up, about the history of sightings of murder victims. Cool stuff! Apparently the idea was taken so seriously through the first part of the eighteenth century that a ghost sighting of someone could be enough to open a murder investigation without any other reason for suspicion! Author Rose LernerPosted on May 7, 2012 Categories history hoydens, The Ghost and Miss MooreLeave a comment on Never shake thy gory locks at me! ETA: This contest is closed. The winner is Justine! 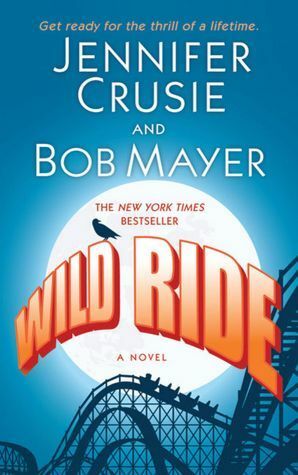 I’m giving away a copy of Wild Ride by Jennifer Crusie and Bob Mayer, signed by Jenny Crusie. She is one of my absolute idols and I’m so excited to have met her and be able to do this! This one isn’t a romance, although both main characters do have romance subplots–it’s a found family story, which I love just as much! The main characters are Mab, restorer of old amusement parks and carnival art (and isn’t that a cool job?) and Ethan, an ex-Special Forces guy whose family has traditionally guarded the demons held prisoner in their old amusement park. I knew in advance that I would love this book because it was by Jennifer Crusie and Bob Mayer and because it was about an amusement park that is also a demon prison. I think my favorite character was Cindy, the ice-cream maker. I loved her ice cream and how her subconscious manifests as dragons and how when the demons were acting out everyone’s worst fear, they chanted at her “Hungry, hungry, can’t feed us!” What can I say, I’m a cook. Plus, I loved the recurring theme of the fortune “He loves you as much as he can, but he cannot love you very much,” because my mom actually got that fortune one time.